THE Bustamante Hospital for Children (BHC) yesterday became the recipient of a blood gas analyser valued at US$62,000, which is expected to enhance the hospital’s ability to respond to it’s patients. 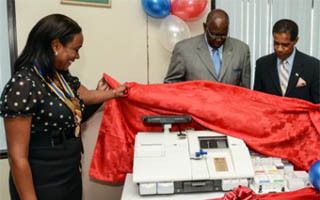 The machine was donated by the Rotary Club of downtown Kingston in collaboration with the Rotary Club of Orlando and Rotary International. It was handed over during a function at the hospital which was attended by Minister of Health, Dr Fenton Ferguson and board chairman for the South East Regional Health Authority (SERHA), Lyttleton Shirley. The analyser will be used to give information about oxygen, carbon dioxide, electrolytes and metabolite in the surgeries and intensive care unit. It is a machine, which Ferguson said was well appreciated by the ministry. Shirley was equally appreciative of the analyser which he was confident would enhance the hospital’s ability to efficiently manage sick patients who seek medical treatment there. The BHC sees approximately 77,000 patients annually, and is the only specialist children’s hospital in Jamaica and the English Speaking Caribbean. “The commissioning of this new high tech blood gas machine will indeed advance our own technological ability to carry out a wider range of diagnostic tests than we would normally be able to do. So there is much for which to thank the Rotary Club of Downtown Kingston, as they continue to be the beacon of support, not only to the Bustamante Hospital for Children, but to the many hospitals that fall within the SERHA,” he said.